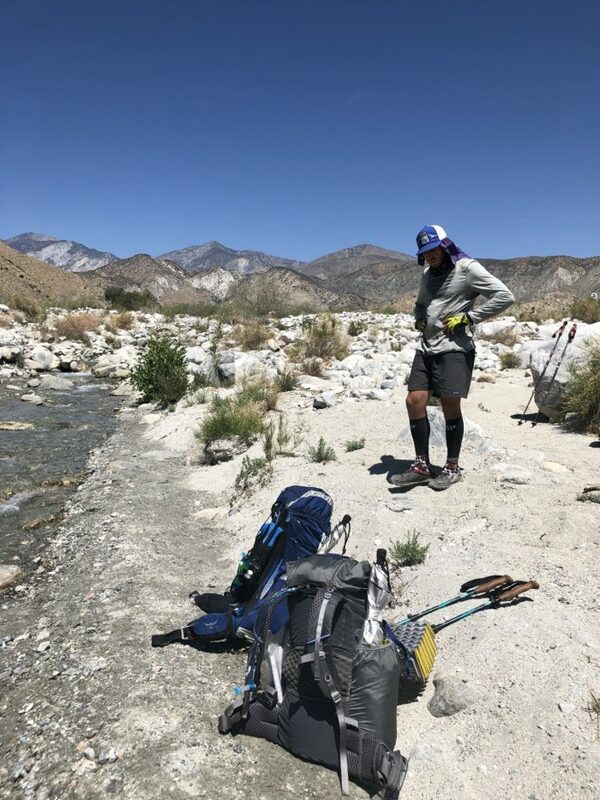 As our spirits rise and our injuries subside (for now), we find ourselves 80 more miles farther on trail and setting our sights on McDonald’s at Cajon Pass. 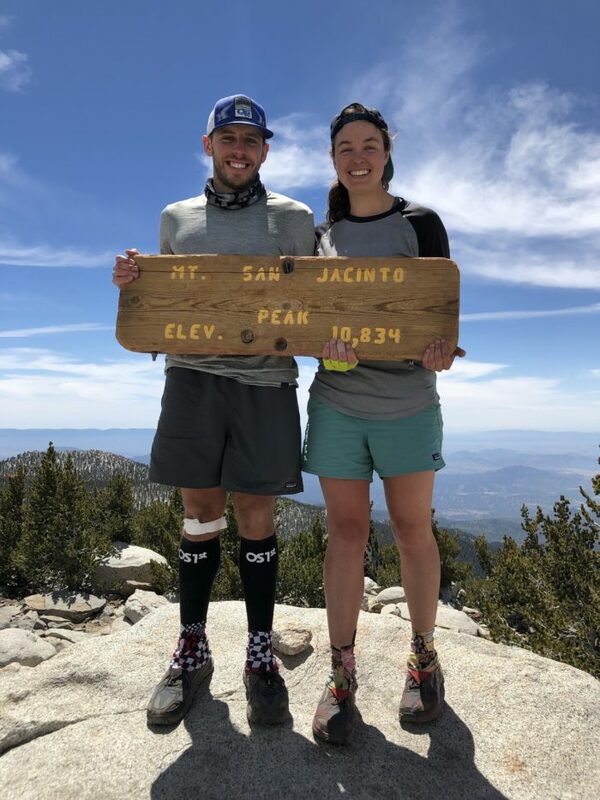 As much as we relished the relaxation and feasting of our zero day in Idyllwild, both Miles and I were super excited to summit Mt. San Jacinto our first day back on trail. Our highest summit prior to San Jacinto was Clingmans Dome in the Smokies, so the additional 4,200 feet in elevation gain was substantial for us. The hike up was slow going, but we were greeted by a bunch of other hikers already taking in the incredible views at the top. The weather was perfect – sunny, 60s, and no wind. 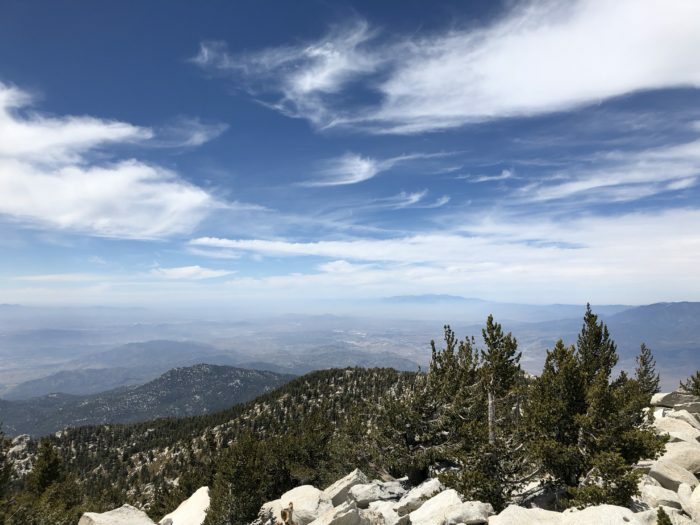 Looking down in one direction was the hot, dry desert and looking across to other side of the peak was the cooler and greener climate of the Idyllwild area. It was absolutely 100 percent worth it to take the side trail loop up to the peak. Little did we know that the next day we would hike 28 miles, the most mileage we’ve ever done in a single day. On the AT, our longest day was a marathon from Boiling Springs to Duncannon, Pa. This 28-mile day was completely unplanned and was only motivated by In-N-Out Burger and the promise of a wading pool and bathrooms at the Whitewater Preserve. The long descent to I-10 was brutal. It was hot and I had to remind myself to drink sips of water every few minutes. Dehydration can come on very quickly and I didn’t want to get to that point. We were getting pretty close to the water faucet, the first water in 20 miles, but I could feel a headache and slight dizziness coming on. Miles was too far ahead at that point, so I stopped in a windy, shady spot to eat a bar and drink some water. It’s amazing what ten minutes of rest in the shade can do. I find that the desert makes me crankier on the whole and where I’m usually at my lowest. Thankfully, the desert won’t be around forever on this hike, so I’m trying to remember that it’s a temporary feeling. But, we did hit the 200-mile marker that day, so I can’t complain too much. The last part of the descent to I-10 was super windy, yet still hot. 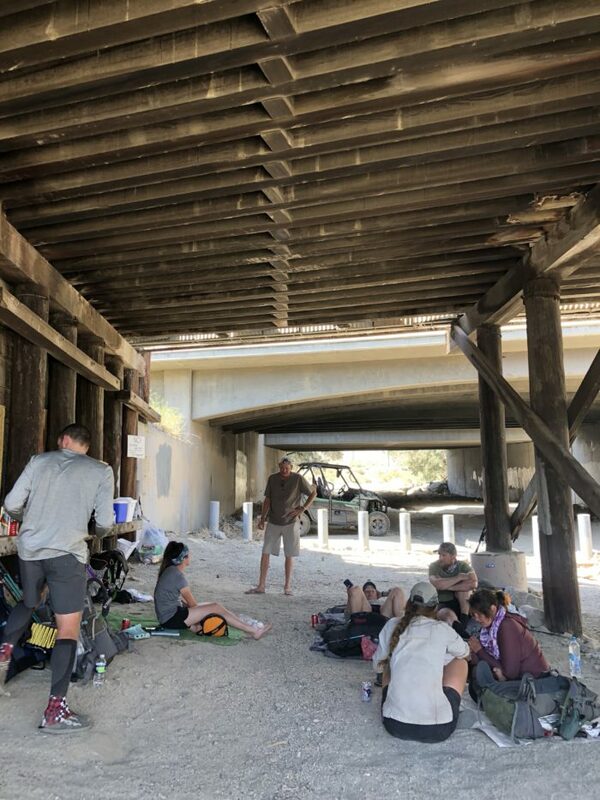 I can’t imagine how terrible I would have felt without the relief of seeing shade and cold water and soda under the highway provided by trail angel DNA. The dedication of trail angels out here is incredible and we are always grateful for their support. We decided in Idyllwild that we wanted to resupply in Cabazon so that we didn’t have to carry five days worth of food. 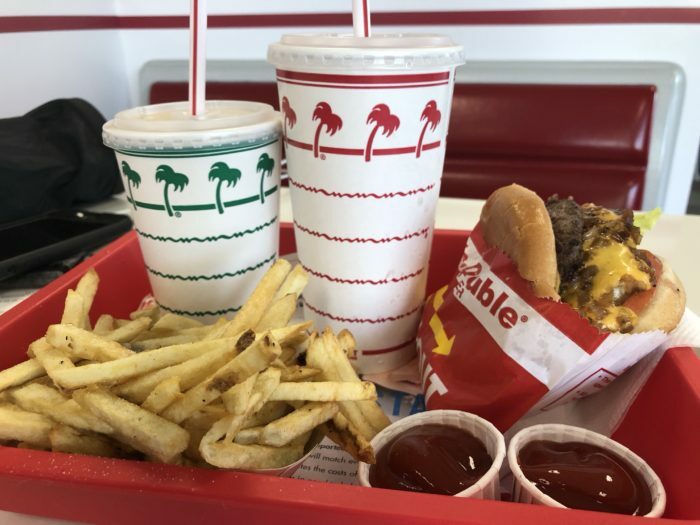 Plus, we found out that there was an In-N-Out Burger in town, so East Coasters that are, we made it a priority stop. After a resupply at Dollar General and an entire #1 plus a chocolate milkshake devoured in five minutes, we made our way back to the trail knowing that we would be night hiking at least two hours to our destination. But yes, that burger stop was totally worth it. After taking a few hours off, we felt pretty good, hence our decision to push on to the Whitewater Preserve after sunset so that we could spend the morning there before continuing on. I can’t say I’m a huge fan of night hiking, but with the promise of flush toilets, a grassy camping area, and ice-cold water to soak your feet in, we just had to get there. As soon as we got to the camping area there, we just lay on the ground for a few minutes, completely exhausted. We cowboy camped under the stars since we were too tired to set up our tent. Thankfully, it was a warm night so we didn’t mind. 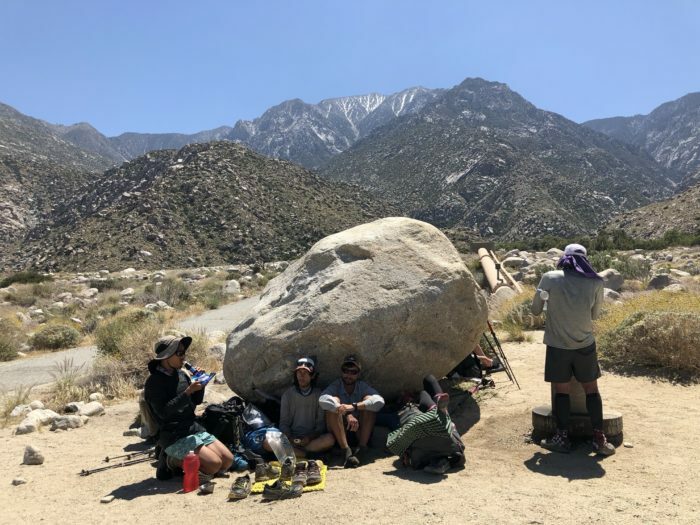 We slept in the next morning and enjoyed relaxing in the wading pool as other hikers arrived and we listened to a teacher introducing her students to the PCT on their field trip to the preserve. 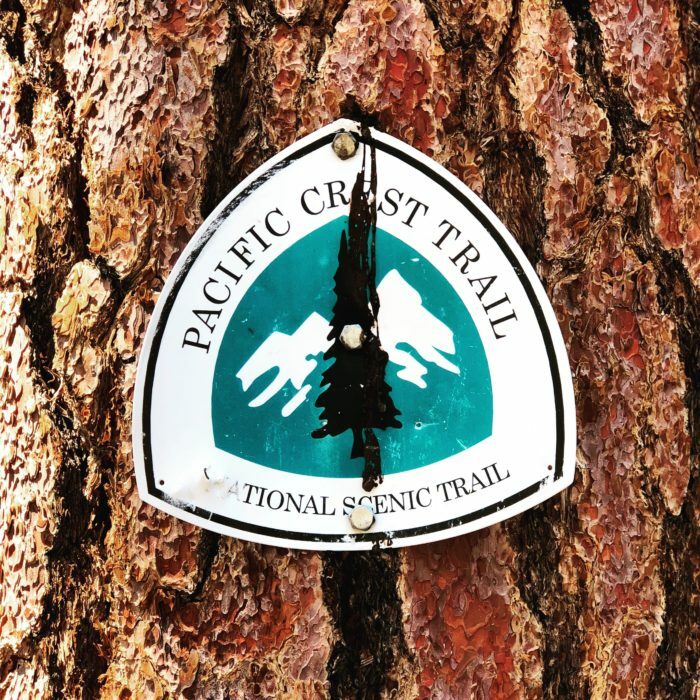 Future PCT hikers: Definitely stop at the Whitewater Preserve. It is an oasis in the middle of the desert and is worth the half-mile walk off trail. Also, the areas before and after the preserve are really the first time we’ve personally heard of several hikers getting heat-related illnesses. 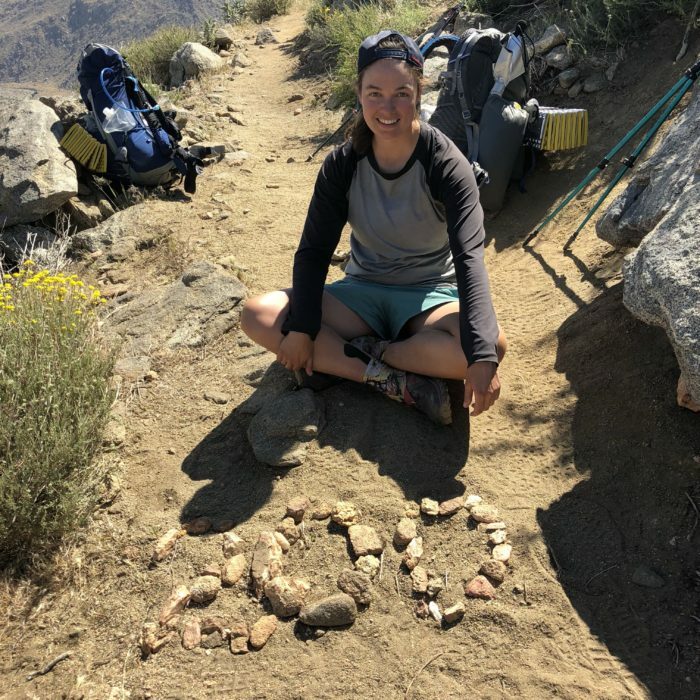 A section hiker that same day had to be airlifted out of the canyon and we know a couple of hikers who had to temporarily get off trail due to heat exhaustion. 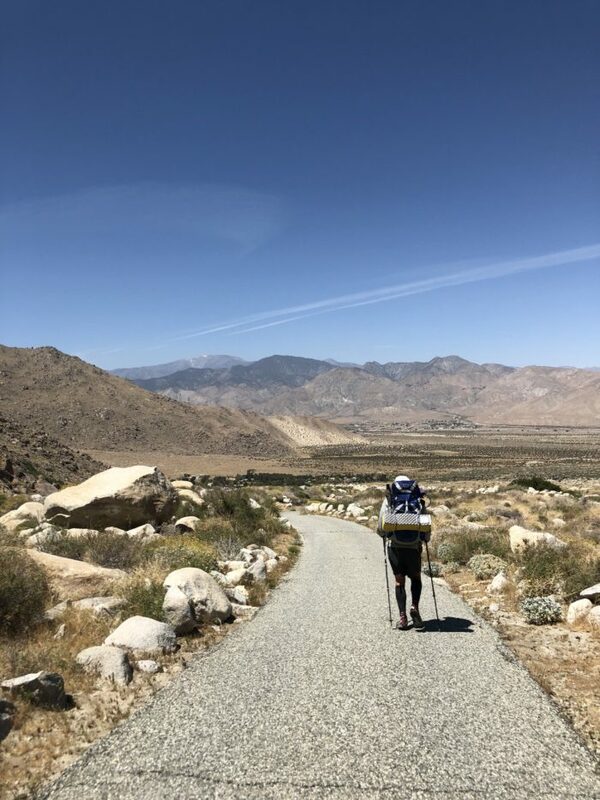 We certainly struggled with the hike out of the desert, but were pleasantly surprised by the easier and cooler stretch of trail into Big Bear. While I still have some pain in my ankle tendons and Miles continues to deal with a shin splint, our injuries have not gotten worse and feel a bit better as time passes. While we did not take a zero here in Big Bear, we took it easy for a day and did a nero out of town. The weather is cooler and I’m finally figuring out how much food I need to buy for resupply. So far, I’ve always had way too much food coming into town. 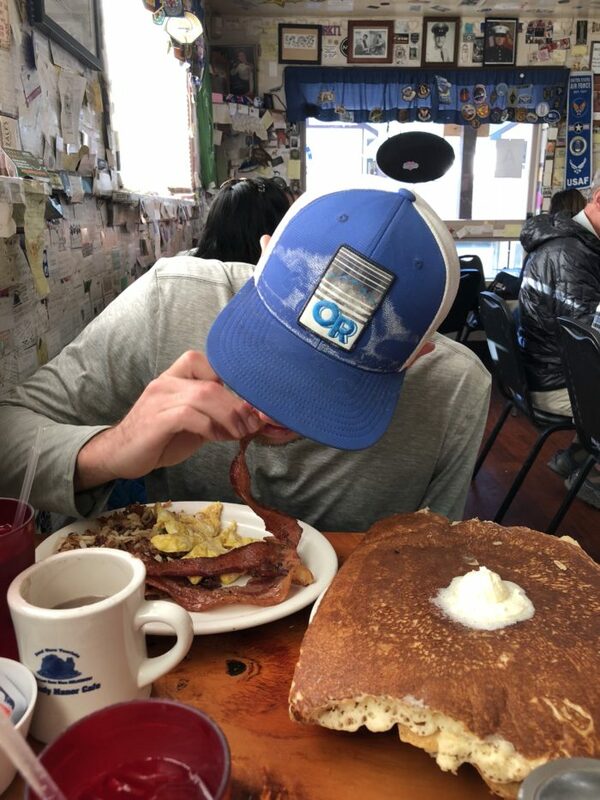 I can’t say the hiker hunger has hit just yet. With the promise of more burgers and shade ahead, we push on to Wrightwood.